Hello, everyone. Thank you for coming to this site to read my family’s story. If you have lost a child, I don’t need to tell you what a life changing and life breaking event that is. I hope that this blog can bring you the opportunity to see that you are not alone, as well as be encouraged in this journey. If you have not lost a child, I hope that you never have to face this kind of pain, but also hope that my writing helps you to help those around you through their loss. Grief is something that makes people uncomfortable, which I find astounding since it is such a universal human emotion. We all struggle and grieve at some point in our lives; it’s time we change the taboo nature of grief and be kind to the suffering. My husband and I met in college. My best friend lived down the hall from him in her dorm, and they became friends. I soon got constant texts and comments that she had met my soulmate. She introduced us and the rest is history, as they say. We were married in May of 2012 and happily began our life together. We both wanted kids and were ready to start trying for a baby after about a year of marriage. Soon enough, we got the positive test! I ran out of the bathroom and told my husband that he was going to be a daddy. That same month he got a promotion at work that would help us to afford our bundle of joy on the way. Life was incredible. We found an OB and started going to appointments. All looked well; I was measuring right on track and my baby had a lovely heartbeat. Anticipation grew as our anatomy scan came closer. After 20 weeks of wondering, I was ready to know if we were having a boy or a girl. In the back of my mind I was nervous about the diagnostic aspect of the ultrasound, but I pushed that emotion down and walked into the office telling my husband that we were having a girl even though just about everyone in his family has boys. During our ultrasound, we found out that I was right – we were having a little girl! I got excited for prom dress shopping and boy talk, and my husband pictured dancing with her at her wedding. We had a few minutes of pure joy. This was soon to be shattered. My OB walked in the door. As soon as he came in I knew that something was wrong. OBs don’t waste their time waltzing in to routine ultrasound appointments. After our ultrasound tech gave him “the tour,” and after 30 seconds of silence that felt like 10 minutes, he softly held my ankle (I was still lying on the table) and told us, “I see some things that are not normal.” He then went on to say that he saw signs of a chromosomal abnormality. He was sending us to a specialist the next day. We came home numb from the appointment, not knowing what to expect with the specialist. We were worried about our little miracle. I jumped on the internet and searched the problems that he told us about, but couldn’t diagnose. I remember crying all night and trying to remember to breathe. The look on my doctor’s face told us that this was serious. We saw a genetic counselor and MFM doctor the next day. After various tests we were told that our daughter had either Trisomy 18 or Trisomy 13, and that 95% of these children do not make it to their first birthday. I shed more tears that day than I ever have. Our dreams for our daughter were shattered. I kept thinking over and over, “I’ll never know her favorite color!” A silly thing to obsess over, but I was in shock and grieving our life together. A few weeks later it was confirmed that our daughter had Trisomy 13, the rarer condition. This means that she had three copies of the 13th chromosome. It happens in the same way that Down Syndrome occurs, except that is three copies of the 21st chromosome. They told us that there was nothing we did or didn’t do to cause it; it happens randomly. Trisomy 13 is much more severe than Down Syndrome, hence the grim statistics. Our daughter had a severe heart defect, cleft lip and palate, and there was some concern about her kidneys. We were told that there was a 50% chance of her passing before term. We decided against traveling so that we could stay close to our doctors in case something happened. At this point, we made a decision to cherish our time with our daughter. She had not yet given up, so neither would we. We named her Caroline and announced it before her birth; I wanted to use her name as much as I could. Every kick was such a blessing. Caroline loved peanut butter just like her daddy. Although her movements were subtle, my kick counts continued to be perfect, and we approached term with Caroline still with us! We knew she was a fighter. We prayed that we get some time with her and that she not suffer. My water broke on a Tuesday night. My OB was going on vacation the next day, so we debated paging him. We gave it a try, and just as we were about to call the general hospital number, he called me back. We gathered our bags (that had been packed for months) and headed for the hospital. My doctor came in and delivered Caroline before leaving on vacation the next morning. Caroline was BORN ALIVE on March 26, 2014! And so perfect. I can’t express the joy that my husband and I felt in that moment. I remember thinking as I held Caroline for the first time, that she was worth every second of heartache over her condition. She was a true miracle and defying the odds. We had her baptized right away, not knowing how much time we would have with our incredible gift. A few days later, we took Caroline home on hospice care. The impossible had become possible. We were more prepared to come home with our arms empty than to bring our daughter home. This was such a happy time. Caroline was doing very well, and did not need any strong pain medications. Symptoms of her heart condition arose later on, but were much milder than cardiology had predicted. Caroline loved cuddles, sunshine, and music. She was the biggest joy that our family has ever seen, and was a content, sweet baby. We documented everything with pictures. Caring for Caroline was the best thing I have ever done. I saw that I was meant to be her mom and lead her back to Jesus. 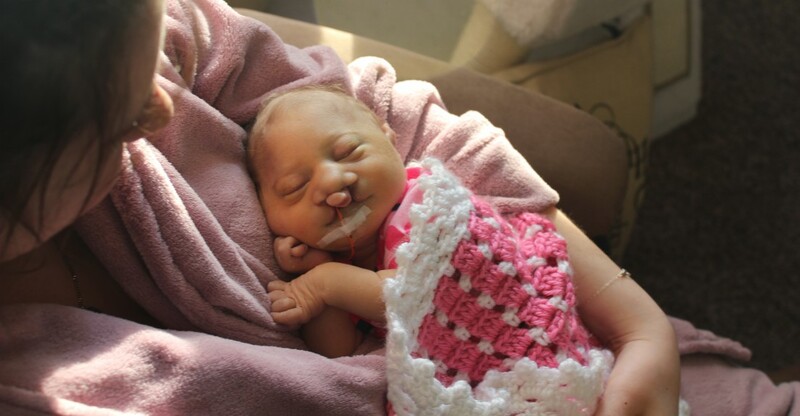 Her condition was unfair but I was Caroline’s mom and did everything I could for my very wanted and loved daughter. We sang to Caroline, took her on walks outside, held her close, and admired everything about her. At the same time, we worried about what was inevitably coming. We did not want our baby girl to suffer. After 58 amazing days, Caroline left our arms for those of Jesus. We had prayed for time with her and that she not suffer, and both were realized. Every decision that we made for our daughter was made with love. We love Caroline Grace with all our hearts, and she took a piece of our hearts with her to heaven. Since that day, my husband and I have been trying to live in a world that doesn’t make sense. I still have days where the grief is so strong that my entire body aches from the pain. Future posts will explore this grief and how I manage to get up each day without my baby girl. I knew how to be her mother when she was here. I am now learning how to be her mother when she is in heaven. What a beautiful angel! Thank you for sharing her with us. I am so glad that you had precious time with Caroline after she was born. I also lost my daughter when she was two months old. I know both the immense joy and the immeasurable heartache. I will keep Caroline in my heart!